The building of the Erie Canal was the engineering marvel that unleashed the growth of the young nation that was the United States. Spearheaded by the vision of Governor Dewitt Clinton, New York State built the waterway that opened the West to settlement and made New York City the center of finance and commerce. Opened in 1825, the canal proved so commercially viable that construction of an enlarged Erie Canal began just eleven years later. The success of the canal spawned the growth of cities, towns, businesses, and industries along its route in upstate New York. 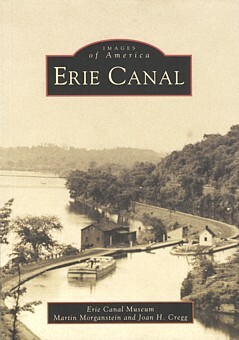 Erie Canal takes you on a ride through the heyday of the old Erie Canal. You can swim with the Volunteer Life Saving Corps as they sharpen their skills, view images of mule-drawn boats wending their way through scenic countryside, and marvel at the engineering of the bridges, aqueducts, and locks that facilitated the functioning of the canal. Erie Canal travels a step back in time and illuminates the people whose lives were shaped by the canal. The Erie Canal Museum, founded in 1962, seeks to keep Erie Canal history and heritage alive. Martin Morganstein, development director of the museum, and Joan H. Cregg, volunteer guide and researcher at the museum, have carefully selected from the museum's extensive collection over two hundred images that depict life on the Erie Canal. These early images highlight canal cities and towns and the people that gave these places their spirit and vibrancy. They display the beauty of nineteenth-century rural New York and take your, imagination on a trip through a bygone era on the Erie Canal.